Sunshine and dry weather meant it was time for my annual visit to Bowers Rock State Park. The park is a good place to see natural open space along the Willamette River. And it’s still hard to get to because there’s no easy place to park and the only access road tries to keep the public out. The park’s 568 acres are undeveloped, though some of the land appears to be cultivated. But it has a proper park entrance with the usual signage at the western end of Bryant Way. One of the private road signs on Bryant Way, the way it looked in March. 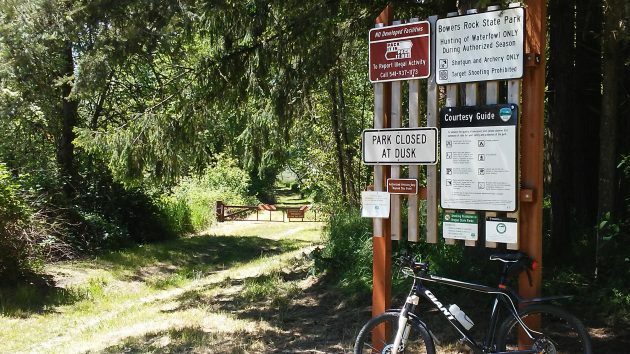 Over the years, Linn County Commissioner Will Tucker and Brian Carroll, the county parks director, have tried to address the access problem. Carroll said the county would work with neighbors to address their concerns about access and security. The county, he added, would manage the park as open space with minimal development to complement trail access. As for security concerns, the county would provide on-site staffing to deal wth them. But that’s where the matter rested. When I contacted State Parks last week. I heard that a regional manager just then had planned to get in touch with the county. The results of that contact, if it happened, I don’t yet know. 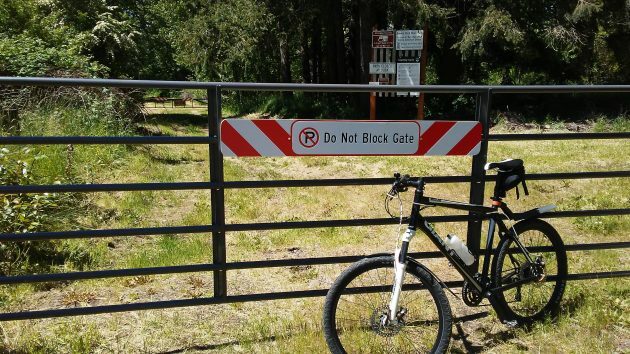 This gate is new, but there’s a gap on the side for walkers and cyclists to get through. The entrance to Bowers Rock State Park last week. You can get there on foot or on a bike. I have been to Bowers Rock’s many times, and I have canoed the entire length of the Willamette. This is the best, most extensive stretch of riparian forest on the river. It is an absolute gem of tremendous importance. Consequently, the best outcome would be as a showcase state park. A county park won’t cut it. I’d prefer of the county leaned on the state harder, and offered to partner with state parks. If there is “legal” access on Bryant, why are private property owners allowed to post signs on a “legal” ROW?, therefore trying to hinder access to public property? All the state has is an easement which does not give them a right to open it up to public use. How do I know? I owned the property at the beginning of Bryant Way for 40 years and dealt with the state after they purchased the back acreage from the Kleinkes but not the front portion across from my piece. It is landlocked and their easement is only 30 feet which is 15 feet from each of the front 2 parcels. Hasso, thank you very much for your work on Bowers Rock and similar access issues. Since the tags don’t seem to work (at least for me), a good Google search for the older articles is “site:hh-today.com bowers rock” (without the quotes). 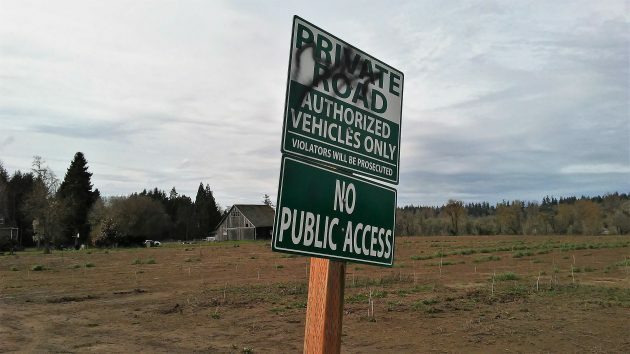 I never said it is a private road which it isn’t. I said the state cannot use an easement to allow the public to access the property for the purposes of a public park. If the property was zoned for 5 acre parcels you couldn’t use the easement to allow purchasers of the parcels access to the property they purchased. When access is outlawed, only outlaws will have access ;-) Seriously, that sign will not stop real troublemakers, just law abiding citizens whose potential presence could deter troublemakers. Isn’t the real problem motor vehicles on a dusty gravel road? (I assume it’s the same as a few years ago). If I lived on Bryant Way, I’d be very much bothered by cars, especially if they go faster than a crawl. It’s about 1500 feet from the paved intersection to the park entrance, 15 to 20 minutes walk each way. Obviously, the best way to visit is by bicycle. Maybe a solution is to have a gate of some sort where the paving ends allowing only non-motor-vehicle access to outsiders or a big, nasty “No parking anywhere beyond here” sign. There’s a bigger issue here. It’s about how we allow presumed automobile dependence to overwhelm every aspect of civic life. Isn’t the big opposition to the latest North Albany development really about car traffic? Building height can be mitigated with landscaping, sloped to favor residential neighbors, or negotiated downward, but probably few people believe that somehow the traffic monster will be controlled. Wasn’t most of the discussion here about the Post Office and the Carousel about parking (aside from the usual anti-CARA rants)? A quick clue on the desirability of any neighborhood can be had by looking at the density and location of parked cars – worst is multiple cars parked in front yards, sticking out onto the sidewalk. Population and house density aren’t really the problem, cars are. No picnic tables. No frisbee golf baskets. No swing sets. Even the water feature is off limits. Perhaps the best usage is as it sits …. an unmolested or at least minimally molested stretch of Oregon land. Raw and pristine. Thanks for the short video tour HH.